There was a worry that it would difficult going back to the 'day job' of the league after the fantastic experience of Wembley, but you get the feeling that this team still has more to come from it and it's not just a case of passing time over the next few months. This was another tight game where the narrative could have gone any way, from disappointing defeat if Newcastle had taken one of the numerous chances in the second half or a well earned point if the first half Swansea performance was taken into consideration and the game had ended goalless. In the end it was a slightly fortuitous three points thanks to Luke Moore's late winner. With the magical 40 point mark now reached, it'd be good to see who in the squad is worth keeping so it may be we won't get to see Shechter break his duck. As I've mentioned previously (such as after the win at Arsenal), Moore has something about him but there also seems to be that extra something missing that would turn him from an OK to a great player. If that something can be coaxed out over the summer then I think him and Michu could work really well together even if it's just as a regular 'super-sub'. The Newcastle game was another game where Swansea started well creating chances and having plenty of the ball, the second half was more Newcastle although most of their attempts, although good opportunities were not clear cut chances. 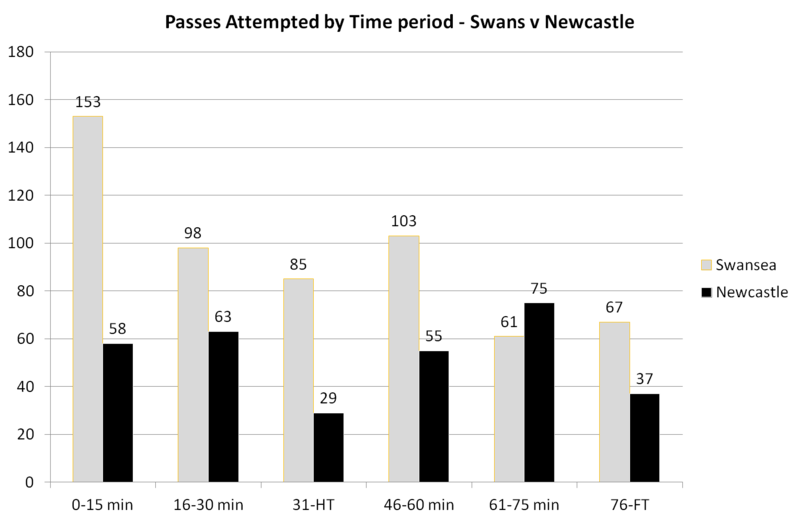 The change in pattern between halves can also be seen in the comparison of passes attempted by 15 minute period. Swansea dominated the early part of the game but the 2nd half was far more even. Passing and attacking are obviously not the same thing but for a team to have more of the ball than Swansea generally suggests they are having a far greater influence on the game. Despite only playing around an hour on Saturday, Nathan Dyer was again the most fouled player in a match (4 times) and is by far the most fouled player in the team. 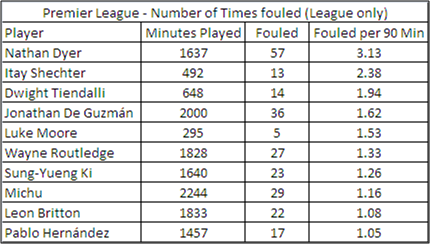 Of those who are regular players, Dyer is fouled almost twice as often as De Guzman who is the next most fouled. The number of goals we have scored from open play is testament to the free-flowing play but does suggest we are missing out on 'free' goals from Set Pieces, having scored only 3 set piece goals in the league all season (arguably 2 of our best chances against Newcastle came as a result of free kicks for fouls on Dyer). An extra 3-5 set piece goals over the course of the season could be one of the things to look out for in terms of improvement next season.